Situated in Jorhat Nawgaon district, the Kaziranga National Park declared a World Heritage site by UNESCO in 1985, extends over an area of 430sq.km. It is bounded by the Mikir Hills on the South and Brahmaputra river on the north. The park, 217 km from the capital of Assam, Guwahati was declared a Wildlife sanctuary in 1950 and accorded the status of a National Park in 1974. The park divided into central, eastern and western sectors consists of semi- evergreen forested highlands, rivulets, marshes and extensive plains covered with tall elephant grass up to 6 metres high. The park is famous for Indian one horned rhinoceros which can reach a height of over two metres and weigh more than two tonnes. The area was declared a game reserve in 1908 to save the one-horned rhino. 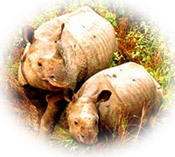 The total number of rhinoceros in the park totals more than thousand which is 70 percent of the total population of this species in the country. A single horn of the rhino is worth exorbitant amounts of money. ( US $ 40,000 in 1995). The park also has elephants, swamp or wild buffalo (Over 70% of the world population), swamp deer, hog deer, barking deer, sambar/ Hoolock gibbon, pythons, civet cat, wild boar and tigers. There is a rich variety of fresh water fowls, over 450 species of woodland and grassland birds of which 18 species are globally threatened. Birds like the egrets, pond herons, river tern, black necked storks, pelican, partridges, Bengal florican stork, pied horn bill, fishing eagle are found in abundance. The river here, has the gharial (fish eating crocodile) and dolphins. March - April is best for animal sightings. Trained elephants are available as mounts for seeing the rhinos at close range. Elephant rides which last around one hour, should be booked the previous evening at the park administrative Centre in Kohora. Elephant rides between 0500 - 0600, 0630 - 0730 and 1530 -1630. Jeep drives are also available. The rides at dawn are best to see the animals. There are three road routes inside the park open from 0800 - 1100 and 1400 - 1630 (1) Kazi ranga or central range - Kohora, Daglang, Foliomari, (2) Western range (Best to see rhinos and buffaloes) - Baguri, Monabeel, Bimoli, Kanchanjuri. (3) Eastern range(30km from Kohora best to see birds) - Agortoli, Sohola, Rangamatia. The observation towers are situated at Sohola, Mihimukh, Kathpara, Foliamari and Harmoti. Other attractions here are the coffee and rubber plantations of the nearby Karbi Anglong and the tea gardens of Hatikhuli, Methoni, Difalu, Behora, and Borchapori.